Geologically speaking, the history of the Alps is a continuous catastrophe. From the initial upward thrust to the final erosion, with in the meantime falling rocks, landslides, earthquakes, avalanches and floods, mountains live and die, ending as a plain after a few hundred million years. Buried under an avalanche, three women survived for over one month in the shattered remains of a stable. An incredible story that stirred imaginations in the 1700s and even today stands as a record of human survival. The Alps are on the move. At the joining point of two continental plates, they shiver from time to time, producing earthquakes that are occasionally destructive. Scientists and an array of measurement devices monitor the turbulence that is as unavoidable as it is unpredictable. The press did not wait for Paris Match to come along before providing readers with spectacular images of the major events rocking the planet. Starting even before the end of the 1800s, Alpine catastrophes provided illustrators with rich material. A selection. Avoid all risk and danger in the mountains, that is the new leitmotif of developers and « consumers ». The desire to ensure safety at all costs is now making its effects felt in the Alps and in Alpine activities, where risk and accidents have become untenable prospects. An unfortunate overreaction with tremendous legal consequences that is in the process of fundamentally changing an entire aspect of Alpine culture. He disappeared in a crevasse and the story could have ended there, during the summer of 1800, had a préfet, a guide, a journalist and a sculptor not decided to do something. In short, a surprising story in which mountains play a part along side politics and noble sentiment. Four dead. That was the price to be paid for the conquest of the Matterhorn in 1865. Obsessed by the elegant pyramid, the Englishman Edward Whymper attempted the ascension several times before the final victory. A success and a tragedy that stand out in the history of alpinism. Killers or benevolent entities ? Mountains cast long shadows or stand forth in the brilliant sunlight, depending on chance and our creative imaginations. On the one hand, the enduring myth of mountains as man killers, on the other the image of the inviting slopes. A short (and exemplary) demonstration in the form of the portrait, rapidly sketched, of an exceptional guide. Guardian angels have watched over the Alpine passes since men have travelled them. The ancient divinities made way for a handful of patron saints while hospices and shelters welcomed travellers. The perils of Alpine voyages produced a tradition of hospitality that has been maintained over the centuries. A tremendous landslide in the 1400s forever modified this small area in the Drôme department in France. The picturesque landscape of Claps de Luc, where the disaster obliterated entire villages under water, is now highly appreciated by artists and tourists. The story of the life and death of an Alpine lake. Permafrost is not to be found exclusively in the Arctic. This soil, frozen year round, is present in a large part of the higher Alps as well. Its role in causing natural catastrophes is now well understood and, given the current changes in the global climate, may represent a formidable danger. « Glacier tragedy » proclaimed Paris-Match at the end of the summer in 1965. On the worksite of a dam in Switzerland, eighty-eight workers died under tons of ice. A predictable accident. Capable of crashing down at any time, the lower edges of glaciers are now closely monitored. Even though the date 23 October 2006 (a Monday as everyone knows) is still fresh in memories, it remains difficult to explain precisely what happened that day. Not the facts, of course, nor the incalculable damage. The problem lies in the interpretation because the very few minds still capable of analysis are now in hiding. What is more, it is virtually impossible to obtain solid information on Jean Martinoux. His devotees have turned the real life of a relatively normal human being into a fantasy story made up of legends. A short story by Sylvain Jouty. Are Alpine cities special ? Perhaps not. Though they are confronted with particular difficulties such as the topology, they are also increasingly obliged to deal with the mechanisms of a global economy. For the time being, the agenda is full steam ahead with periurbanisation and competition with the major European cities. As for the future, that is still up in the air, but major amounts of imagination will be required. Some seventy years ago, a group of artists, mechanics, ethnologists, writers and engineers travelled from one end of Asia to the other by automobile. Everything would seem to have been already said about this remarkable adventure. It is nonetheless with great pleasure that one opens this handsome book published by Glénat. A fascinating and well documented account, complete with colour photographs, for the most part never published. 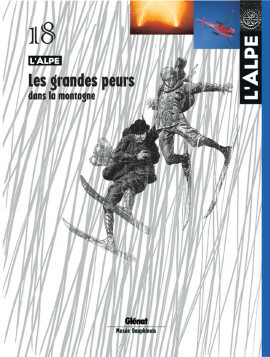 Excerpts in Alps Abroad. Guigoz milk has been a staple for generations of babies. It was invented by an industrious man from the Valais. Having set up shop in Gruyère, Maurice Guigoz discovered how to transform the rich Alpine milk into powder and then made clever use of a new phenomenon called advertising.